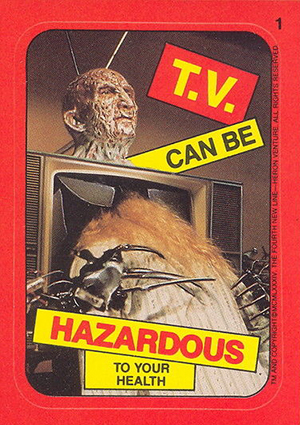 1988 Topps Fright Flicks is one of the most overlooked trading card sets of the 1980s. Featuring a mix of 15 horror films, it's unlikely that there will ever be another set like it. Mixing gore and comedy, it's the kind of set that delights a lot of kids and makes parents cringe. The base set has 90 cards. Done in a similar style to the company's earlier You'll Die Laughing and Creature Feature sets, 1988 Topps Fright Flicks makes horror fun. It doesn't hold back on the gore -- there's plenty of it. But it balances it all with cheesy, groan-worthy captions. The result is the kind of set kids would hide in their drawers and sift through when they thought nobody was looking. While the set is fun in its own right, the fact that it draws from so many films is a licensing feat that could likely not be duplicated today. 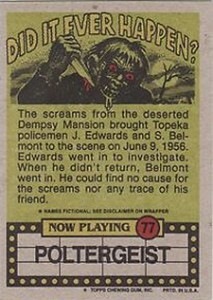 1988 Topps Fright Flicks is currently the only set of mainstream trading cards to feature the original Ghostbusters, Predator and Poltergeist. The checklist is very heavy on the Nightmare on Elm Street franchise with several cards from each of the first three films. This shouldn't be a surprise given the popularity of Freddy Kreuger at the time. Base cards have a very simple front design. There's an (often gory) image, a white border and a one-liner caption done in a cartoonish red font. Card backs are more complex but just as strange. "Did It Ever Happen" is the headline across the top and is joined by an illustration of a knife-carrying monster. Rather than write-ups from the films, each card back acts as a mini urban legend told in 100 words or less. A marquee at the bottom states what film the image on the front came from. Traditional with Topps entertainment products at the time, each pack came with one sticker. The 11-card set has more images from the featured films. Backs can be arranged to complete a puzzle that's a collage of several monsters found in the set. 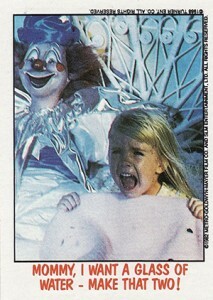 1988 Topps Fright Flicks remains affordable and somewhat available still today. It's by no means rare. 2 Man, That Soup is Hot! 3 Gotta Quit This Nailbiting Habit! 4 I Really Oughta Stop Garglig with Kerosene! 5 I Visit My Dentist Once a Year...Unfortunately He Died! 6 Doc, How Do I Get a Head in This Life? 7 Baby, You're the Greatest! 8 Talk About Obscene Phonecalls! 9 Okay, Who Took a Bite of My Bran Muffin? 10 Darn! Now I'll Have to Learn Shorthand! 11 Open Wide and Say Aaaah! 12 I Ordered a Pizza - Not a Pizza Face! 13 I Gotta Stop Hammering ails with My Head! 14 Do I Get Extra Sauce with These Ribs? 15 Must Have Been Someone I Ate! 16 Hi! I'm the New Babysitter! 17 I've Got a Stake in Your Future! 18 Hey - Who Swiped My Undershirt? 19 Let Your Fingers Do the Walking! 20 Better Fix That Broken Window, Paul - A Fly Could Get In! 21 Now Don't Get Cross! 22 I Tell You, That Nuclear Plant Is Safe! 24 Well I'll Be a Monkey's Uncle...Oh Yeah, I Am. 25 She's Not Exactly a "10" - But She's a Perfect 1/10th! 26 Sorry - Wrong Answer! 27 The Singles Scene Is Murder! 28 Warning: I Brake for Small Animals - And Eat Them! 29 Now You Put on the Bunny Outfit! 30 That's a Heck of a Hangnail You Got There, Pal! 31 Mirror, Mirror, On the Wall - Who's the Grossest One of All! 32 Hello, I'm from ACME Pest Control! 33 Oh No - Now I'll Need to Buy New Gloves! 34 Mayhem? I'm Up for It! 35 One Tube of Acne Gel - King Size! 36 What Do You Mean? I Just HAD a Manicure! 37 By the Way, How's the Meatloaf Here? 38 They Sure Have Ugly Girls in This Neighborhood! 39 Give Grandma a Great Big Sloppy Kiss! 40 No Job Is Too Big for Your Local Exterminator! 41 Darn It, I Forgot the Marshmallows! 42 By the Way - Are You Insured? 43 Honey, Shut the Window - I Feel a Draft in Here! 45 Dishwashing Liquid? I'm Soaking in It! 46 Braces? Really, You Think So? 47 Next Time I'll Use a ELECTRIC Razor! 49 TV Has Gone to My Head! 50 Okay Everybody, Arms Extended - and Stretch, 1-2-3! 51 Is This the Line for Ballet Tickets? 53 Am I Tired - DEAD Tired! 54 Nancy! Come Sit Next to Daddy! 56 Billy...Suzie? Okay, I Give Up. Who Is It? 57 Mommy! You Forgot to Pay the Paper Boy! 58 I Should Have Passed on That Egg Cream! 59 The Label Said NOT to Open Before Christmas! 60 I Wanna Roast Me a Boy Scout! 61 Whew, I'm Really Shot! 62 Charlene, Something Inside Me Is Yearning to Be Released! 63 Can You Spare a Dime for a Bite? 64 It Takes a Lot of Guts to Do This! 66 All Right - Bring Back the Lighter for a Refund! 67 Okay Dudes, Let's Take It from the Top! 68 But Why Can't I Join the Boy's Choir? 69 What Big Teeth You Have, Grandma! 70 But Leave the Side Burns! 72 I've Had It with Those Miracle Diets! 73 I'd Say I'd Give Blood, But This Is Ridiculous! 74 I'll Call You Later, Something Just Came Up! 75 "And for My Next Shadow Picture..."
76 I've Gone All to Pieces Over You, Honey! 77 Mommy, I Want a Glass of Water - Make That Two! 78 Who Said You Could Touch My Toys? 79 Phooey - Nothing's Good on TV Tonight! 80 Have You Seen Your Dentist This Year? 81 Hey, You're Right - I Can See Myself! 82 Hey Pop, That Microwave Really Works! 83 Try the Shrimp Tempura - It's Delicious! 84 Gary Will Be Here at 8:00 and I Can't Do a Thing with My Hair! 86 Whadda You Mean Success Has Gone to My Head? 87 There's Just Never Enough Pate to Go Around! 88 I've Got a Bone to Pick with You! 89 Man, My Dogs Are Killing Me! 90 Thank You, Thank You, Thank You! 9 The Man of Your Dreams is BACK! Here's a breakdown of the base set arranged by film. Stickers are not included. 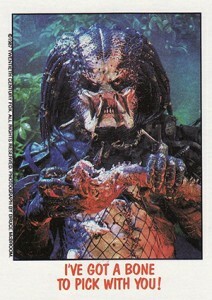 1988 Fright Flicks (Topps) COMPLETE SET of 11 "Sticker Cards" (1-11) PREDATOR!!! Do you have any complete boxes of 1988 freight flicks packages?